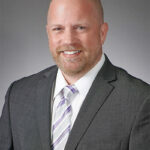 Our own Jacksonville Criminal Law Attorney, Chris Wilson represented a client who was charged with DUI. Although the client provided a breath test and registered nearly three times the legal limit, Chris was able to have those results excluded from evidence. In the process, over 100 breath tests were excluded from evidence at trial. Early in the case, Chris attempted to demonstrate to the State Attorney’s Office that there were irregularities with the way the Florida Highway Patrol was maintaining their breath test machines. Documentation was sent but the State disregarded that information and proceeded with their prosecution of our client. Based upon the State’s refusal to realize the problem, we hired a leading expert on the Intoxilyzer 8000, which is the breath test machine used by every law enforcement agency in Florida. Our expert discovered that the particular machine used on our client had not been maintained properly in the months leading up to our client’s test and for a number of months afterwards. This new information was shown to the State Attorney’s Office. This time, the State Attorney’s Office listened. They had the Florida Department of Law Enforcement conduct their own audit of a number of Intoxilyzer 8000s that the Florida Highway Patrol was using. An avalanche occurred. The FDLE found that four different machines had been improperly maintained from October 2017 through July of 2018. This discovery resulted in every single breath test performed during that time period to be deemed unreliable for evidentiary use in Court. There were 166 people who had been arrested and then tested on these four breath test machines during that time. The State stipulated to excluding every single test from evidence at trial. Our client’s DUI case was ultimately dismissed by the State Attorney’s Office and even her speeding ticket was dismissed by the Court as a result of our efforts. 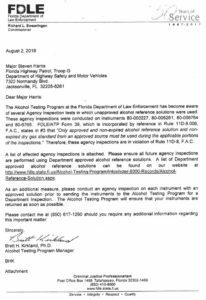 FDLE Letter Re Breath Tests.